The Arctic doesn’t give up its secrets without a fight. 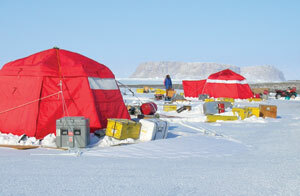 A science team led by OSU oceanographer Kelly Falkner learned that the hard way last year when a sudden windstorm off the northern Greenland coast destroyed their tents and scattered debris for miles. No one was injured, but the incident underscored the dangers of working in a harsh environment. Falkner is no stranger to such risks. Over the last ten years, she has helped to establish Arctic monitoring stations and flown to remote areas to collect water samples. As a professor in the College of Ocean and Atmospheric Sciences, she traces the origins and changing circulation of Arctic waters by analyzing water chemistry. Since 1978, when satellite measurements of Arctic ice first became available, the overall ice cap has shrunk more than eight percent each decade.